At first I said no. I did not want to see a captive bear and ruin the magic of my wild bear sightings from the previous few days. But then I changed my mind – deciding that the opportunity to see such a magnificent creature up close was not likely to come around again in a hurry. I now hope that I never have the opportunity again. Justine and I were being driven back from the southern tip of Sakhalin to Korsakov, where we would be officially stamped out of Russia, before taking a boat ride back down to the south to start our kayak crossing to Japan. 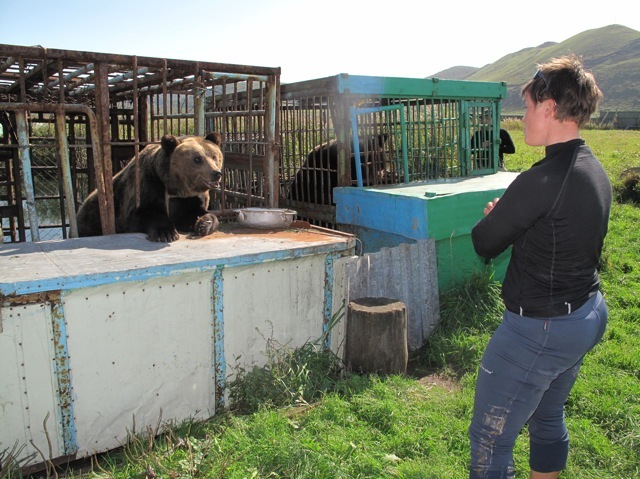 We were told that a tiny hamlet en route had two captive bears; one had come from a circus and the other had been orphaned as a young cub after hunters shot its mother. The bear came to the village to find food and, on being fed by the residents, eventually became a danger as he grew older. At 350kg an adult male is a formidable force and a danger to people at close range, so the villagers took him in and caged him. He has lived there ever since, being fed treats through the bars of his tiny home, where I suppose he will live out his days, padding the tiny cell and waiting for food. I watched, intrigued, as the orphaned bear, now a hulk of fur and muscle, sat down obediently to slurp soup noisily from a bowl held out to him through the bars by a housewife in a garishly patterned nightie. She obviously had a soft spot for him as she cooed in gentle Russian tones, ignoring his circus neighbour now craning his head through a little square space in the metal grid that marked the boundary of his world and mine. I had already fed my offering of dried apricots and bread to the circus bear, watching quietly as he snaffled it hungrily, keen for more as soon as he had finished eating. His head was nearly as wide as my shoulders and his paws the size of two of my hands, curled claws as long as my fingers. Both of them were beautiful, the circus bear a golden brown and the orphan a dark shade of treacle. Yet I was not happy to see them. Having hoped for sightings ever since arriving in Russia, and especially since coming to Sakhalin, I was now glad not to have seen more than the four wild bears on my tally and the various clawed footprints on the beach – it is better for both sides if bears remain nervous of humans and avoid contact. It hurt to see these two animals eyeing us nervously as they ate, and then pawing through the bars for more food, unable to live in the wild. I was silent, humbled and saddened by their captivity and man’s role in it. Perhaps the saddest thing was the size of their cages and the lack of stimulation – if they were in a big zoo or wildlife park they would have more space and probably be made to find their own food within their enclosures. Walking away, I wondered if their could have been a better alternative. I am still unsure. But one thing I did know – the grass beneath my feet, the roar of the waves on to the beach and the blue sky tent above felt even sweeter than before. I made a silent promise to myself and to them, to enjoy my freedom forever and do my best, where I can, to help keep wild things wild. Yes I agree with you Sarah. It is no life for such a magnificent creature. Why could they have not released it after it had passed its cub stage. Could have transported it to a remote area. The circus bear is a different thing. Used to being caged and probably would not take to the wild. The only other way is to give them a bigger compound to live in. Anyway there is nothing you can do about it. Until the next time.God bless.Peter Nottingham. I want to make a sensible comment but too saddened to be considered. 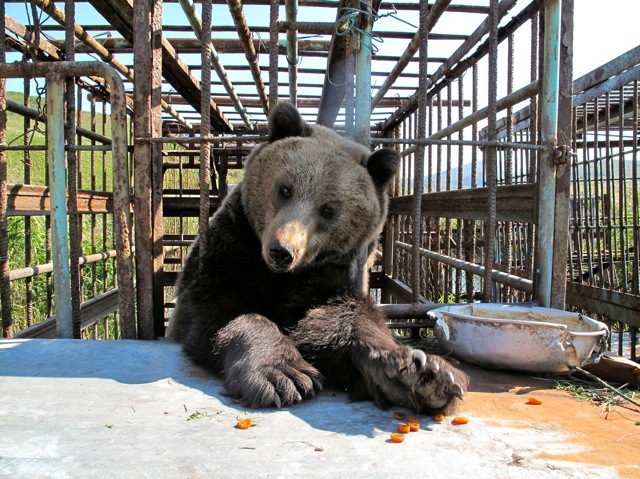 Isn’t there anybody out there, any organisation to help these caged animals lead a better life destined for a Bear? Circuses – I HATE THEM!! I agree with Susie, it makes my heart weep to see these two magnificent creatures waisting away their lives as prisoners to man’s vanity, please, please, please someone rescue them as soon as possible! And a plea to the education authorities in Russia, wild animals are meant to live in the wild! Freedom to be free, freedom to not be. Bottom line: freedom is a gut need….for all things. Oh that is not very nice seeing that beautiful creature looking so sad and lonely. The eyes say it all !!? Don’t you feel a huge cuddle would help lots. Maybe there is someone out there whom could help release this agony and release them back into the wild. It’s just not right animals being caged up and having humans gawking at them for pleasure. We should be content to observing Nature through cameras, Attenborough-style, with fascination but non-interference. The bear on the beach was a great moment to share. Glad you’ve arrived safely in Japan – something to celebrate! Have a nice rest during your stay there. Sj razumeš kaj je morje? Si hodla v osnovno šolo? This is terribly sad and inhumane to see these beautiful bears in such a small enclosure. There should be a sanctuary somewhere that could help the bears. They deserve better than this and they need to be able to live out the rest of their lives in dignity.I hope someone will take interest in helping them.